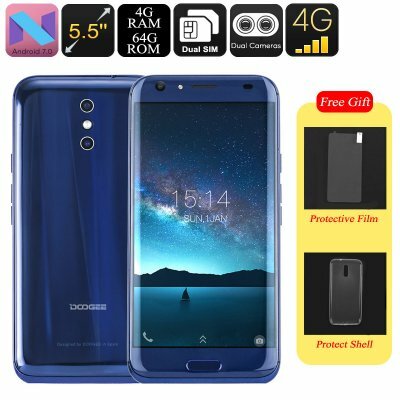 Successfully Added HK Warehouse Doogee BL5000 Android Smartphone - Android 7.0, Octa-Core CPU, 4GB RAM, 1080p, 5050mAh, 13mp Dual-Cam (Blue) to your Shopping Cart. Take the most out of your daily smartphone usage with the Doogee BL5000 Android phone. This Android smartphone comes packed with a whopping 5050mAh battery. When fully charged, this cell brings along a stunning 10 hours of continuous usage time. With all this juice at hand, you’ll be able to get through multiple days of regular smartphone usage. From now on, you can play games, watch movies, and browse the web the entire day. With this Android phone in your pocket, you’ll never be stuck without power again. On its beautiful 5.5-Inch display, this Android phone lets you enjoy all your favorite films, series, and games in crisp 1080p resolutions. You’ll be treated to 64GB internal storage and a 128GB SD card slot. Therefore, you’ll never have to worry again about running out of storage space. Via Google Play, you’ll be able to download the latest media available that all can be enjoyed smoothly thanks to your phone’s Android 7.0 operating system. With Dual-IMEI numbers and 4G at your disposal, you can browse the web at lightning speeds no matter where you’re at. The Doogee BL5000 Android phone packs a powerful Octa-Core processor that reaches speeds up to 1.5Ghz. Along with 4GB RAM, you’ll be able to tackle the most demanding software features out there. Whether it’s games, films, or anything else – this Android phone is sure to meet your demands. It even comes equipped with a professional-grade 13mp dual-rear camera. This piece of equipment lets you shoot breathtaking photographs and 1080p Full-HD video of all those special upcoming moments in life. The Doogee BL5000 Android Smartphone comes with a 12 months warranty, brought to you by the leader in electronic devices as well as wholesale cell phones..